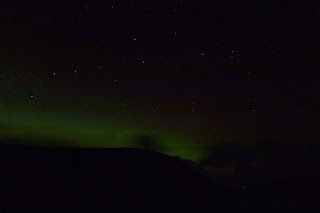 Fair Isle Bird Observatory: the Warden's diary: Remember, remember, the blog in November. Remember, remember, the blog in November. 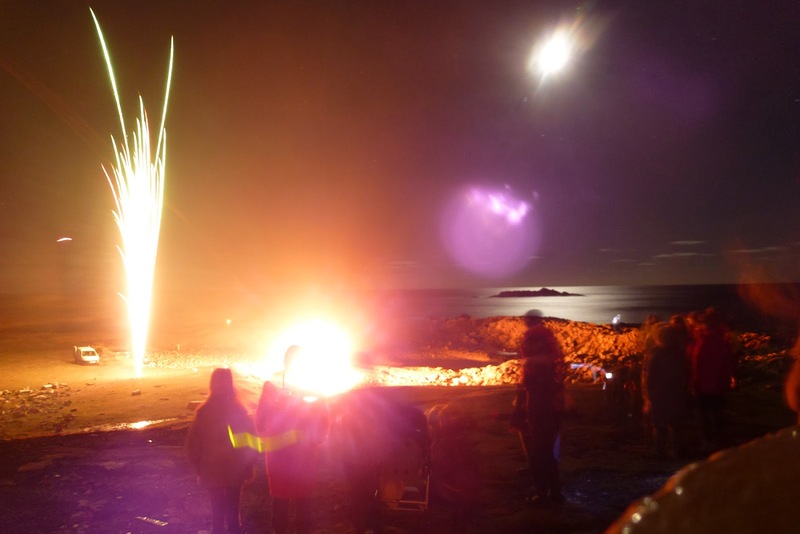 Bonfire night was put back due to poor weather, as November has seen a succession of windy and wet days, interspersed with some pleasanter weather, although the island is still pretty soggy. Ok, sorry it's been a while. Despite what you may think, we've not been hibernating. Far from it in fact; Susannah and I have had to learn to look after ourselves now that the Domestic Team have all left! In between remembering how to cook, clean and look after the children, I kind of forgot to update the blog. It wasn't helped by Susannah popping off the island for a night and eventually making it back about a week later, but, as we're heading off for a couple of weeks, I thought it was time to finally catch up. 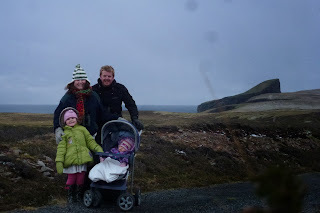 So make yourself a brew, settle down and catch up on the goings on of the Parnabys and life on Fair Isle during the last month. We don't get to go out much as a family during the Obs season, so whatever the weather, we try to make the most of the winter. Let’s start with the birds. There was a general theme of a few lingering highlights at the start of the month, then things quietened down before an unexpected late fall on 12th then a gradual decline in numbers and variety again as another fabulous autumn finally drifted away to be replaced by the typical winter fodder of wind, few birds and a ridiculous amount of paperwork (over 70 descriptions amassed this year – sorry if I’ve mentioned that before, but between that and Annual Reports, it’s fair to say that I’m not exactly sitting back with a cigar on at this time of year!). 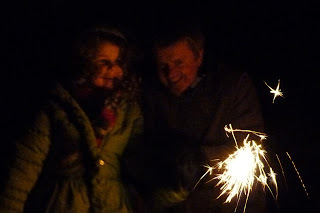 Sparklers - better than cigars! We couldn’t manage a last hurrah, despite there being Short-billed Dowitcher to the south, Dusky Warbler to the North and, perhaps most gallingly of all, Little Egret to the west (Foula leaving us as one of the few main Shetland islands not to have recorded a Little Egret, surely one of the commonest vagrants to Shetland not to have turned up here yet. In fact, with 4 Purple Heron, 2 Night Heron and a Little Bittern on the Fair Isle list, it’s bizarre that there hasn’t been a single Egret or a Bittern yet). 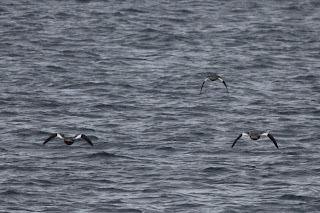 In fact, the only new addition to the year list since the Siberian Rubythroat was a Shorelark at North Light, a lovely highlight in the fall of 12th (although it disappeared shortly after discovery as a truly evil hailstorm swept the island. It’s not often I attribute emotions to the weather, but these hail stones really did want to hurt people, they were nasty – I was left whimpering on the ground trying to hide behind a rock on the exposed clifftops of Easter Lother). 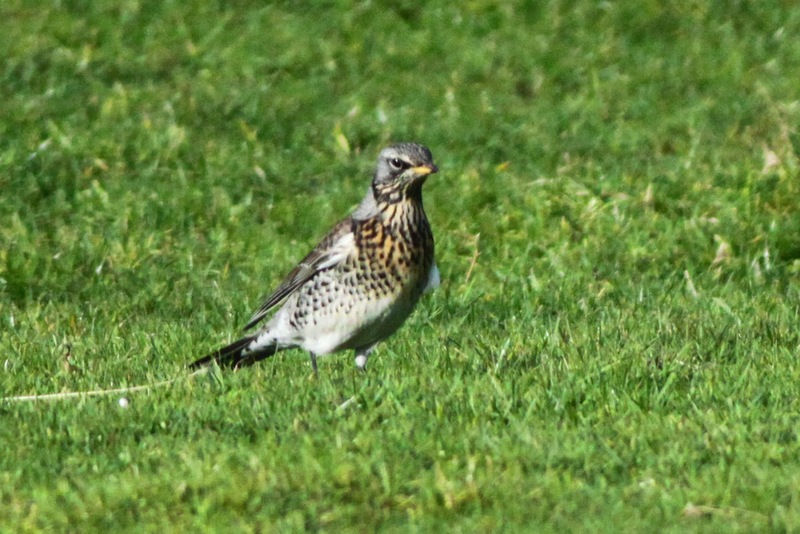 The 12th also produced counts of 37 Woodcock, 646 Blackbird, 164 Fieldfare, 93 Redwing and 11 Robin (including the Dutch-ringed bird that seems to be attempting to overwinter at the Obs), although with only two people covering the island, these are likely to be underestimates, particularly of Woodcock which were probably spread thinly across the whole island. Thrush numbers have dropped right off since the fall a couple of weeks ago. 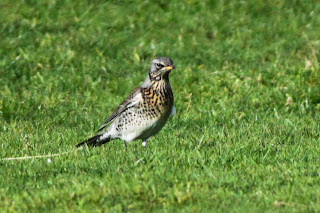 Fieldfares and Song Thrushes are now pretty hard to come by, whilst just a couple of dozen or so Redwing and Blackbirds are hanging on. There were few other signs of new arrivals, although there were 3 Goldfinch on 2nd and 2 from 20th-25th (rather late records for this species). 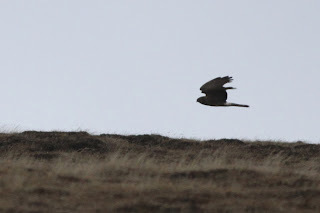 There was also Kestrel (4th-15th), Short-eared Owl (6th and 12th), Jackdaw (7th-10th), Moorhen (19th-20th), Knot (3rd), Linnet (14th and 17th) and Black Redstart (2 on 2nd with one to 4th), whilst a Wren trapped on 5th appeared not to be one of the local birds. Lingerers included the Olive-backed Pipit (to 2nd), Richard’s Pipit (to 12th), Bullfinch (to 2nd), Grey Wagtail (to 16th), Hen Harrier (to 9th), Chaffinch (with 2 still present), Brambling and Mealy Redpolls (up to 10) to mid-month, Chiffchaff and Blackcap (both to 19th), Goldcrest (1st), Woodpigeon (to 2nd), whilst the last Bonxie was seen on 8th and the Tree Sparrow that turned up in mid-June finally departed (it was last seen on 6th). 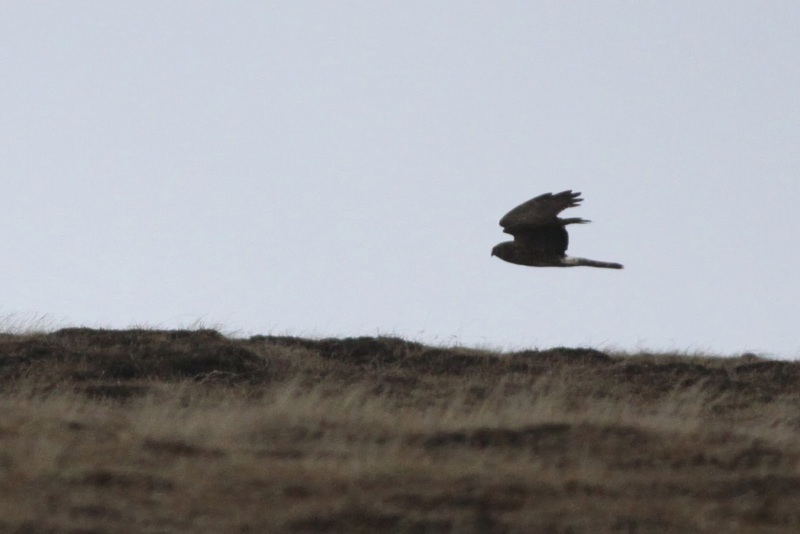 At least one (probably two) Hen Harrier remained into November, with one spending most of its time on Gilsetter, so it could be seen most days from the road on the School run. 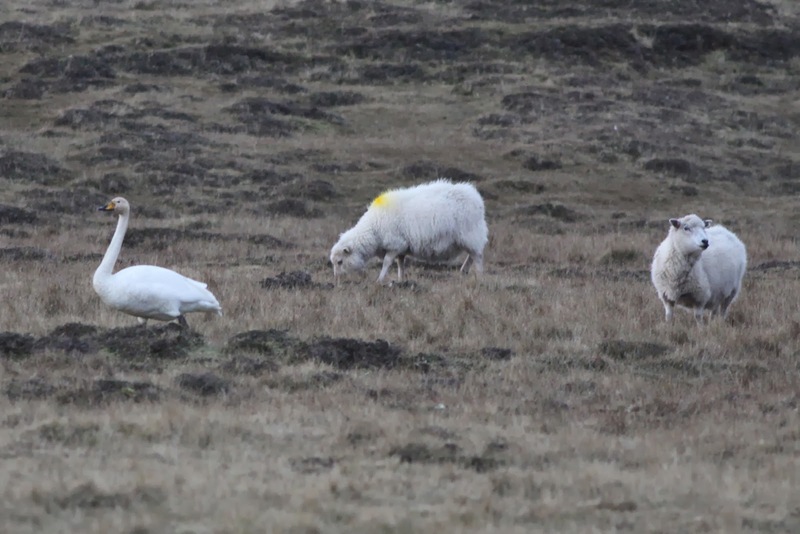 Typical winter fare included up to 2 Glaucous Gulls on 5 dates, Iceland Gull (sightings of juveniles on 1st, 14th, 20th and 23rd), Water Rail (at Lower Stoneybrek on 7th, in what appears to be a quiet autumn and winter for this species), a maximum of 98 Snow Buntings, 3 Little Auk on 5th (with another on 10th) and up to 3 Jack Snipe amongst good numbers of Snipe (which peaked at 142 on 7th). 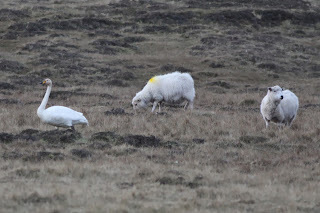 In the absence of any of its friends, this Whooper Swan did the best it could and started hanging out with the sheep on Suka Mire. Wildfowl are also usually prominent at this time of year, with highlights including 3 Goosander (21st-22nd), a few south-bound Whooper Swans (13 in total, including one lingering from 19th), Greylag passage peaking at 365 on 4th, with 303 on 19th, up to 8 Barnacle Geese (until 17th) and up to 17 Pink-footed Geese, mostly early in the month. 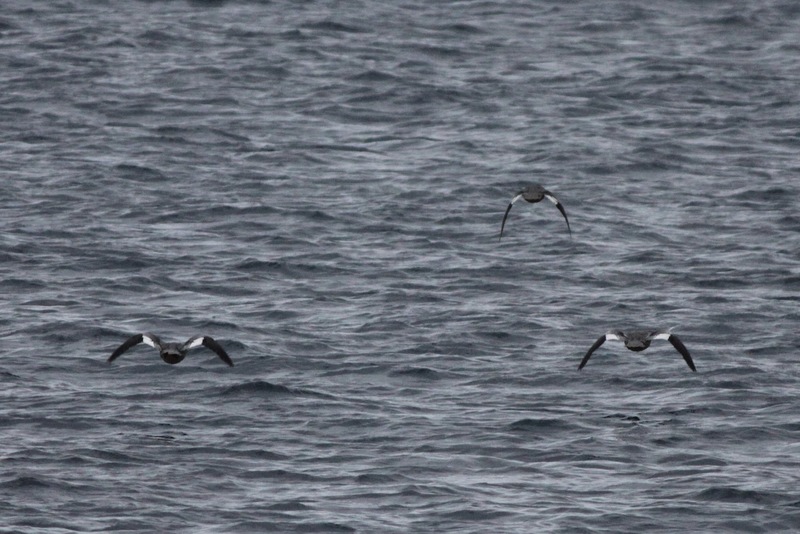 At sea there were up to 10 blue Fulmar and a Sooty Shearwater from the Good Shepherd (5th) and a Great Northern Diver off South Light (12th). Not quite an annual species on Fair Isle, these Goosanders were the first since the wintering bird of 2012/13 was last seen on 1st January. Aside from the birds, we’ve also been keeping an eye on the Grey Seal population, which seems to have done a tiny bit better this year, although pupping was rather late. 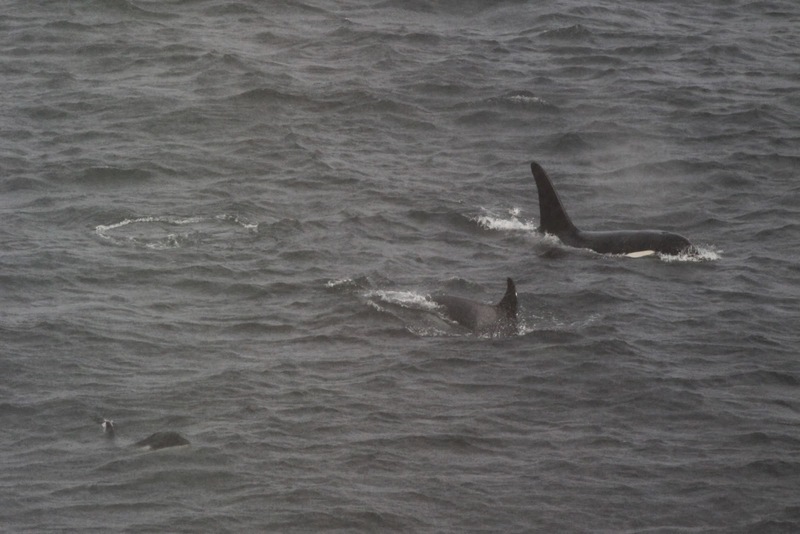 A few updates from wildlife sightings from the last few weeks, starting with those immense Killer Whales that appeared at the start of the month. 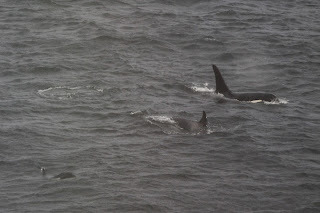 Andy Foote from NAKID has identified the individuals as a group that are regularly seen in North Scotland and the Northern Isles (and as far as the Faroes) in the winter and spring, with the male being about 19 years old and the youngest a calf from the winter of 2009/10. The animal on the right is older than a few of our volunteers this year. The slight haziness of the photo is due to the animals swimming through a rainbow! Other updates from previous sightings involve DNA analysis of Chiffchaffs; the count of 41 on 15th October that seemed to involve mostly tristis-type birds has been backed up by the lab work, that showed that the two trapped birds were indeed both of this subspecies. 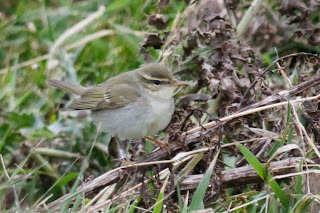 The Arctic Warbler on 14th October (one of the latest Fair Isle records) was also shown to be an Arctic Warbler on DNA (rather than either of the recently split, but possibly not identifiable in the field, far-Eastern warblers: Japanese Leaf or Kamchatka). Thanks as ever to Professor Martin Collinson for providing this information. One of the Siberian Chiffchaffs trapped on 15th October. 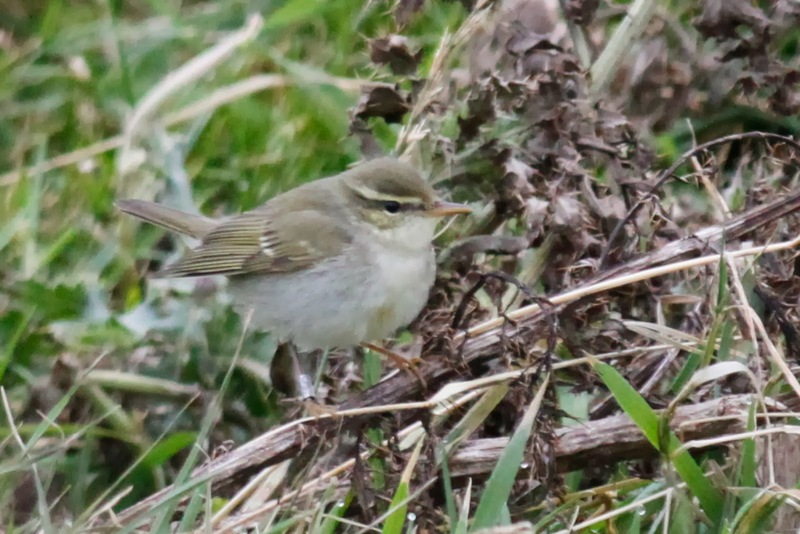 The Arctic Warbler on 15th October feeding at Shirva having being ringed the previous evening at the Obs. Although a Japanese Leaf Warbler would have been nice, the fact that it looked like an Arctic Warbler (albeit a strong-billed one) made it quite pleasing that the DNA backed this up. Surely that would have been a tremendously underwhelming way to add a species to the British list! ﻿So, I still await the ultimate prize of a first for Britain during my time as Warden, but on the subject of winning prizes (see what I did there? 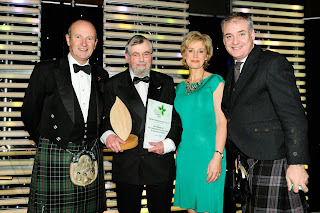 ), there are a couple of awards to mention. 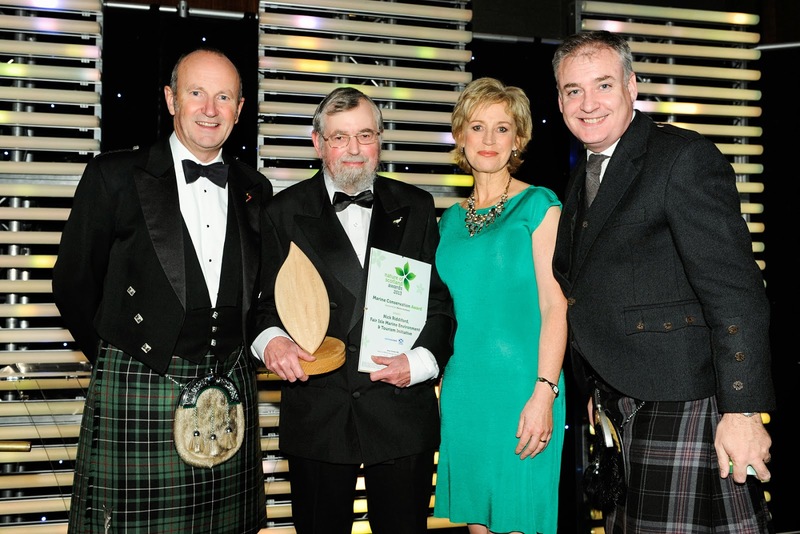 FIBO itself has won a Shetland Environmental Award in recognition of our work and the green credentials of the building, whilst Nick Riddiford’s efforts in campaigning for a Marine Protected Area were rewarded with a Nature of Scotland Award. Congratulations Nick, a well deserved award and everyone at FIBO hopes you are rewarded with the prize you really want and thoroughly deserve – suitable protection for the waters around Fair Isle. It's been generally too cloudy for much Aurora action so far this winter, but there was a good show on 31st October, a great way to end the season! So, that's all for now folks. As I mentioned, we're away until 17th December (all being well with the weather...), so if the year is going to be crowned by one last outrageous rarity, I hope it waits until then to turn up! Bonfire night and a great array of hats (note: not all of these are authentic Fair Isle knitwear!). Amazing Photo... I loved it..